Shrink Wrapping, Shrink Packaging or Bundle Wrapping is a packaging process in where a group of products is wrapped in shrinkable plastic film which, after exposing to hot air, holds the products firmly together for transport, as a sales unit or for ease of inventory management. Our website is designed to help you decide if and what shrink packaging process and machine is right for your product and environment. However, one has to be aware that not all products can be transported and handled by machine and not all products can be shrink wrapped. Contact Autopack and use our experience to quickly find a competitive solution for your needs. Shrink packaging like any packaging process involves: Preparation of wrapping material (film),Preparation of product,Enclosing (wrapping) in a sleeve of LDPE film then Shrinking / cooling and discharge. Each part of the process including the product itself can effect the speed, versatility and quality resultant pack. However, the two main factors are: product collation and wrapping system. For this reason Autopack offer many grouping options and two wrapping systems to match customer requirement. All these forms of packaging, as well as shrink wrapping, can have custom designs printed on the packaging. One or more products are fully enclosed. The box can be sealed with glue/tape, or with interlocking flaps (like toothpaste carton). The products are placed in a cardboard tray for easier handling. Similar to trays, but since crates are more durable and reusable. Low cost, water resistant, less scuffing of labels. Easier and much cheaper to Automate in comparison to tray or case packing. Leaking mostly contained to single pack, not damaging full pallet. What sorts of products can be shrink wrapped? Most bottles, cans, cartons and boxes are ideal for shrink wrapping. It is also possible to shrink wrap many other sorts of products. Very lightweight or oddly shaped products can be challenging to shrink wrap, either because they are hard to convey and collate during the wrapping process, or because they can not form stable geometrical group which after handling may become loose. Can the high temperature of the shrink process affect my products? Due to the short exposure time and protection offered by the shrink film itself, very few products are affected by the process. Even foil-wrapped chocolate can be shrink wrapped. However thin PVC trays, thin PET containers or not fully filled CSD bottles can distort during the shrinking process. How many products can fit in a bundle? Are the products fully enclosed? No. Although the film shrinks around the products, there will be a round opening in the film on either side of the pack called "bulls eyes". Can I use the same machine for different products? Certainly!. Most Autopack machines are designed to be rapidly adjustable to a wide range of products. Submit an enquiry if you would like to find the best machine to suit your needs. 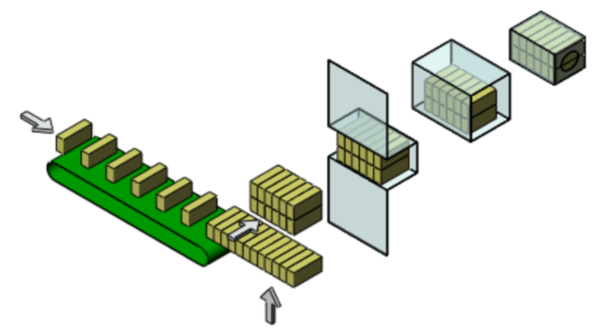 The bundle passes through a heated zone of the shrink tunnel, where re-circulated hot air causes the film to shrink and conform the the shape of enclosed products. Once outside, the pack is cooled by forced air to tighten the film forming semi rigid pack ready for stacking on pallet or further downstream packaging. There are two ways of wrapping the shrink film around the products. This is the traditional way or Sleeve Wrapping using two, top and bottom film rolls. The two are joined to form a film curtain. When product is ready, it is pushed through, Welding Bar (Sealing Bar) comes down to form a sleeve on the collation of product at the same time cutting the film and rejoining the curtain for the subsequent pack. This process uses single film roll, where a pre-cut sheet of film is wrapped around the product, with the loose ends overlapping beneath the pack. The overlapped region is partially fused in the shrink tunnel at the same time as rest of the sleeve is shrunk to enclose the contents. The main advantage of Weld Bar type machines is lower cost and smaller footprint. The main advantage of overlap machines is higher throughput, better suited for printed film, they tend to be longer and more expensive. For additional pack strength or ease of handling, a cardboard pad or tray can be introduce under the product before being shrink wrapped.